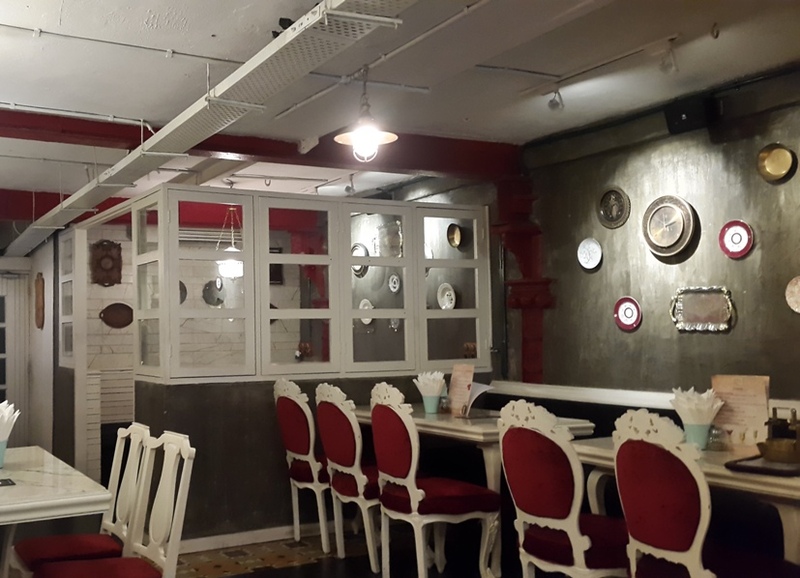 Grubzon - A Gourmet Voyage: Bombay Vintage - Colaba,Mumbai. The scoundrels attacking us were inexperienced and desperate men. Since they were imitating our every move, we baited them by deliberately firing a blank vertically upwards and then triggered an explosion in their midst making it appear that the vertical shot made the hit. The fools used the little powder they had to fire vertically upwards and well what goes up comes down. Their foolish shot took them out, well most of them. Our landing party got hold of Cuvo who was trying to crawl away with his rather slow first mate Aruso. Bombay Vintage is a place that has been around Regal cinema for close to a year. 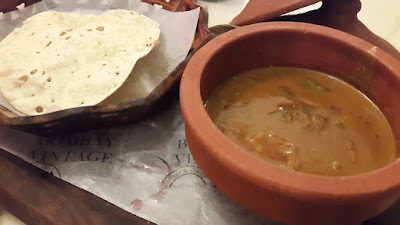 Admittedly, I was not well informed about the place till I actually arrived here to sample their grub and grog for their curry and cocktail festival. The place has a nice classy vibe to it. The decor is a mix of Victorian and the early 1900s. The music is either instrumental or 80's greatest hits, both genres which I adore greatly. Their regular menu feels very much like a mix of English, a bit of Mediterranean and the like. However this special menu features many famous curries from India and around the world. It also includes a small cocktail menu which has unique drinks which will no longer be offered after the festival concludes. 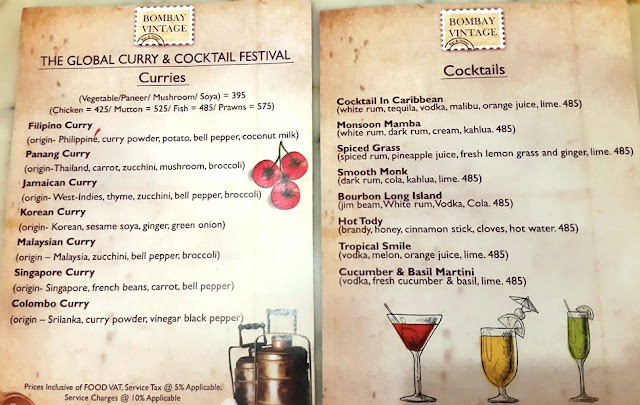 The Festival runs till the 18th so if you are a curry connoisseur, treat your hungry self to the curries at Bombay Vintage. Cocktail in Caribbean was a mixture of White rum, Vodka, Tequila, Malibu and some fruit juice. This was a mildly potent and largely sweet cocktail whose flavor was largely dominated by the coconut flavored Malibu rum. The color probably came from the orange juice and drink felt very much like a beach cocktail. Cucumber and Basil martini was a fun cocktail made out of fresh cucumber, vodka, basil and lime. The flavor felt like liquor made out of cucumber itself. The cucumber's flavor dominated the drink. 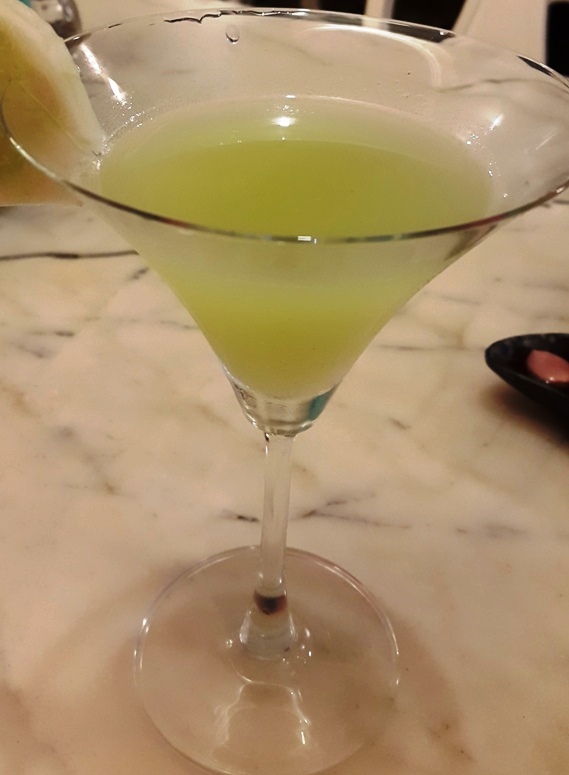 My first time with a cucumber martini. Jamaican Curry with Rawas(Indian Salmon). I went by the staff's recommendation and chose Rawas as the protein. The menu lets you choose your own protein and roughage. Now I have never had Jamaican curry before, so I cannot be a good judge but traditionally its eaten with huge chunks of chicken and not seafood. The flavor was salty and mildly spicy with Thyme, Allspice and veggies thrown into the mix. I read up a few blogs and it seems that the curry itself was accurate in flavor. Just that I should have chosen chicken instead of fish. 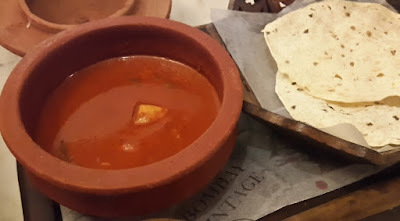 The curry was light on the tongue and should be eaten before you try any spicy or stronger flavored curries. Jasmine rice concerted well with this curry. Since it is Jamaican, I wonder if this could be called a soul curry. Try and not have this with Indian items like Appam, Dosa, Boiled rice or Vada unless you want to destroy the authentic Jamaican experience completely. There are always risks of giving the patron complete control over the ingredients and elements of a fine dish. Korean Curry or Kare Raiseu is meant to be had with rice. 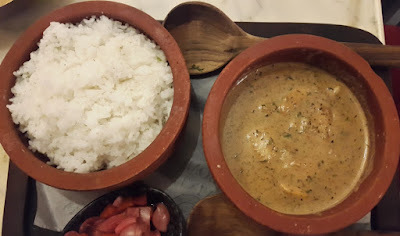 Bombay Vintage's Jasmine rice option is ideal for this curry. The flavor felt a little flat. But that could be due to my taste buds wanting something strong on flavors. I had this with Prawns but this goes better with red meats like mutton of beef. Little Cuvo : This isn't over. I am called Little Cuvo for a reason. Big Cuvo will not forgive you for this. Captain : Look at you, gigantic size but lesser of a mind than Hodor. You seriously think I'll fall for that lad? Little Cuvo : (Cries) Aruso save me. Captain : Your gluttonous friend is a little busy at the moment. But worry not lad, you will join him soon. Mongolian Curry was perfect on all factors - Aroma, spices and the choice of chicken as protein. There are several variants of this curry. Some are on the yellowish side while some are reddish. Some are dense while some are thin like Bombay Vintage's version. This was a spicy curry with the flavor of Hoisin sauce and oyster sauce being most prominent. It had an earthy flavor and felt very oriental. Do note that if you have a low spice tolerance, go for a milder curry. This curry was hot. The service was cool. The servers were dressed up as dabbawalas and were professional. It does feel weird to see a dabbawala speak good English though ha. The only flaw was that I was given inaccurate protein recommendations for the Jamaican curry. Bombay Vintage's pricing seems ideal for this part of town. A course for two including two curries and two cocktails works to about INR 2200 which is lesser than what it may cost in other fine dine places in Colaba. Heck, it is even cheaper than some uptown Cafes. The curry and cocktail festival is a limited feature which concludes on the 18th of August, 2016. The event menu is large. 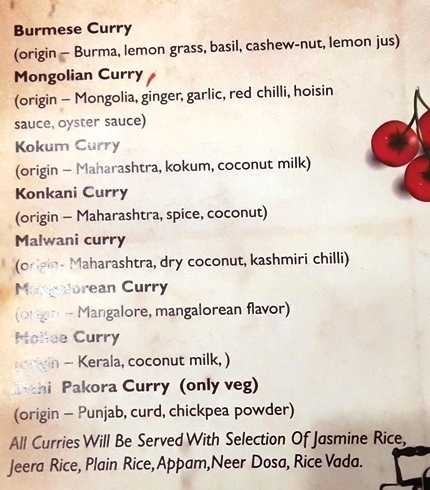 I just sampled three curries and there is a whole unexplored world out there. The food is good provided you know your curry combinations well. Firsty : Out of curiosity, what did you do with them mate? Captain : Well it was difficult to row to the shore with all these sharks in the water. Captain : Aye, those toxic little scallywags gave them poor sharks a serious case of food poisoning ha. Firsty : Guess we are free to explore the next mark then. Captain : Aye but lets be careful. There could be more jokers like Cuvo and Aruso around.